During the last few years, many journal articles have shown the usefulness of the Additive Main Effects and Multiplicative Interaction (AMMI) model for analyzing regional yield trials. AMMI helps agronomists and breeders in several ways: to understand or model complex data sets, especially the interactions; to estimate yields more accurately, even with less data; to make better selections; and to design more efficient yield-trial experiments. This book is the first systematic treatment of these topics, collecting concepts from the scattered literature and also presenting many new results. Although agricultural applications are emphasized here, AMMI is applicable to two-way data tables containing one kind of data, either replicated or not, so AMMI appears in many areas of science and technology. The volume's first seven chapters review the agricultural and statistical principles and the final chapter indicates the difference that AMMI can make for agricultural research and world food supplies. This book will be of great value to agricultural scientists throughout the world, enabling them to learn more from their data and thereby make greater progress. Preface. 1. Introduction. The Yield-Trial Experiment. Research Purposes (Accurate Estimates. Reliable Selections. Insightful Models. Efficient Designs). A Brief History. Conclusions. Summary. 2. Basic Statistical Concepts. Four Opportunities for Accuracy. Mathematical Notation. Populations and Samples. 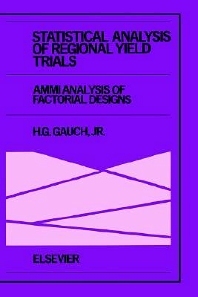 Treatment Design and Experimental Design. Pattern, Noise and Error. Prediction and Postdiction (Definitions. Statistical Assessment. Model Criteria and Choice. Fixed and Random Effects. Levels of Prediction. Agricultural Progress). Interaction. A Dubious Dogma. Summary. 3. AMMI and Related Models. AMMI Data. Treatment Means Model. ANOVA Additive Model. Linear Regression Model. PCA Multiplicative Model. AMMI Additive and Multiplicative Model. SHMM Shifted Multiplicative Model. Other Statistical Models. Model Comparisons. Summary. 4. Estimation. Assigning Degrees of Freedom (Structural df. Pure Noise df. Pattern Plus Noise df. Choosing an Accounting). Postdictive Accuracy. Predictive Accuracy. Imputing Missing Data (Interaction Absent: ANOVA. Interaction Present: EM-AMMI). Inspecting AMMI Residuals. Empirical Evidence of Accuracy. Selecting the Best AMMI Model. Summary. 5. Selection. Order Statistics. A Soybean Example. Selection Systems (Simulation of Selection Strategies. The Numbers Game and Noise Game. The Interaction Game. Practical Selection Systems). Corn and Wheat Examples. Summary. 6. Modeling. Biplots for Model Diagnosis. Modeling Interactions. Mapping Genotypes. Understanding Locations. Defining Mega-environments. Causal Explanations. Applications (Physical Sciences. Engineering. Social Sciences. Medicine and Pharmacology. Business). Summary. 7. Efficient Experiments. Research Costs and Benefits. Partitioning Research Resources (Combining Information. Analysis of Experimental Designs. The Selection Triathlon). Statistical Expectations. Open Questions (Optimal Selection Strategies. Heritability. Stability and Dependability. Value-Added Seed). Summary. 8. Conclusions. References. Index.